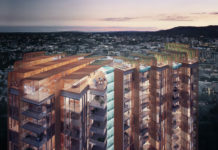 Charter Hall has officially submitted a development application for Brisbane Square Tower 2 which is located at 266 George Street. Last month Charter Hall had reportedly produced a “compelling offer” which helped to secure a heads of agreement with QSuper, who have been shopping around for space to accommodate QSuper’s new 17,200 sqm headquarters. 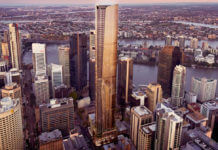 If approved, the 36-storey ‘suspended commercial tower’ would reach 185m high, which would make it the fourth tallest commercial tower in Brisbane. Retention of existing Brisbane Square office building, library and ground level retail uses. 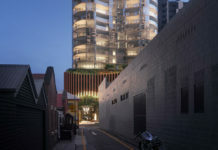 Designed by Blight Rayner Architects, a ‘suspended tower’ design has been proposed in order to retain the function of the existing civic plaza at ground level. According to the development application, this will ensure that Redcliff Place can continue to operate as a large, publicly accessible civic square. 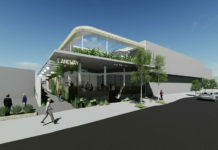 The space will include equivalent access, facilities, amenity and connections to the Queen Street Mall. Improvements will also be made to the ground level lobby within the existing building with the creation of a new ‘Great Hall’ which plans to make the space even more active. “The proposal is organic in approach both in planning, spatial relationship, landscape composition and environmental performance resulting in a slender tower allowing views into and out of the city. 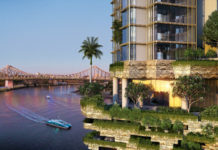 The proposed organic form marks Brisbane’s two most important streets as the gateway to the retail heart of Brisbane as well as becoming a counterpoint to the existing Brisbane Square and neighbouring developments, 300 George and Queens Wharf. The existing ground plane is reimaged by creating Brisbane’s first indoor public square- notionally call the “Great Hall” – is designed to embody the notion of “exchange” where people meet with the Brisbane community, where products can be showcased, and through which visitors ascend to a subtropical podium overlooking the river and South Bank. This Tangible sense of interactive marketplace is then able to be reinforced through tenant’s workplace levels, creating a “business with boundaries” Our concept epitomises these Buildings that Breathe principles which range from environmental technical performance to public realm engagement to vertical gardens and elevated outdoor spaces. At the base, we proposed to reimage Reddacliff place which will be the city’s fulcrum of public movement and interaction. The above will result in a total of 5,314m2 of outdoor open space on site. This represents a nett increase of 3,357m2 (288%) compared with the existing situation on site. 55m2 storage area for use by the market. Facilities for offsite monitoring of the building performance via the internet. The proposed development involves an overall reduction in the number of car parking spaces provided on site. Some existing car parking spaces will need to be removed to accommodate new structural columns within the basement levels to support the new tower. The development application number for this project is A004790156. A great design but in a incredibly woeful location. Just another example of continuing diminishing public space in Brisbane. Brisbane’s civic & commercial leaders rave about Brisbane’s status as a “new world city”, which is great, but at the same time, one of the defining elements of world cities (vis a vis New York, London, Paris, etc) are the parks and open spaces that they have and, with the example of New York’s Highline, continue to expand. Cities are about people but in Brisbane, we seem to take 2nd place to thoughtless development. The lower half up to the little green terrace is lovely; the tall building part with the unsightly struts is awful. It will impede the river-view from the mall, and lots of the other buildings, and really crowd that entire area. Brisbane is already struggling to fill all of the office space offered by the current buildings; shouldn’t we wait for more tall buildings until there is a market for more office spaces instead of flooding the market further? I agree with the other comment- this seems like thoughtless development- building for the sake of building without any thought to beauty, space or profit. So how much of Brisbane’s open space is truly publicly owned? In several more years time whats stopping another company coming in and building another tower in the square or inserting more retail boxes/PODS? The so called 288% increase in open space means nothing if on a whim they can lock the doors or turn off the elevator (the exact same problem is going to happen down the road at the Queens Wharf site when the casino ropes off large areas of ‘public space’ for events & happens at 480 Queen St). At the end of the day there is a decrease on ground floor open space (how many will really take the trip to the elevated ‘public’ open space & how many will even know its up there?). What ever happened to the core city building ideas like bustling streets and not removing people ground. Another let down by council & State Gov when we are relying on developers to deliver open space when their interest are not aligned with the public interest. This literally kills off all public spaces in front of Council building. where the market, event and demonstration protest are held. My biggest question is how come we the “owner” of this public space does not have any say in this development? this is the stupidest idea ever proposed. Who wrote this biased one-sided article? Where is the other side of the argument for NOT having this monstrosity or clichéd ‘organic form’? Hideous beyond belief and to think they had the audacity to submit an application for it. I see a long, prolonged and hopefully unsuccessful submission. This is probably the worst imaginable location for a new tower. In addition to the points the other comments are describe, the tower absolutly destroy´s the view on Tower no.1. As you can the at this picture.